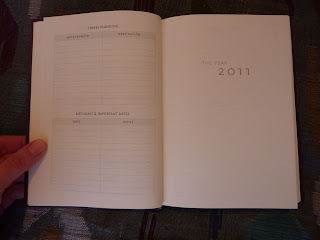 Today is the day of my self-imposed deadline to decide which planner I will use for all of 2011. At least, that was my optimistic self back in November declaring such a thing. Somewhere in the middle of January I was thrown a major curve ball with the discovery that not only are we most likely doing another international move this year (after just doing one less than 6 months ago), but it could happen as soon as March. Things are not finalized yet, and the timeline is still under construction. But either way, this year is turning out to be very different from how I expected it to be. 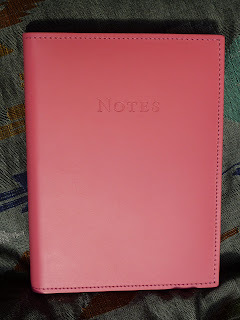 So even though I'm not promising myself or anyone else that I will manage to stay with only one planner for the entire year, I thought I would recognize the day anyway and let you know what I'm currently using (which has very recently changed). 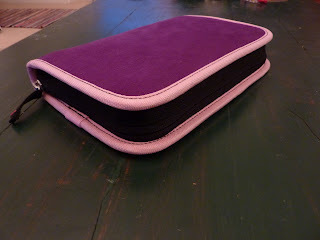 I won't drag you through the whole saga, but for the past couple of weeks I was using my personal size Deco Filofax. But, while using it I've been absolutely in space and feeling completely directionless (which I admit is not entirely my Filofax's fault). So this morning I went back to my self-made planner. Yes it's not much fun. But right now I need focus and motivation. My self-made planner helps me focus because its week + notes format with the days as vertical columns allows me to see what I need to do and when I have time to do it. 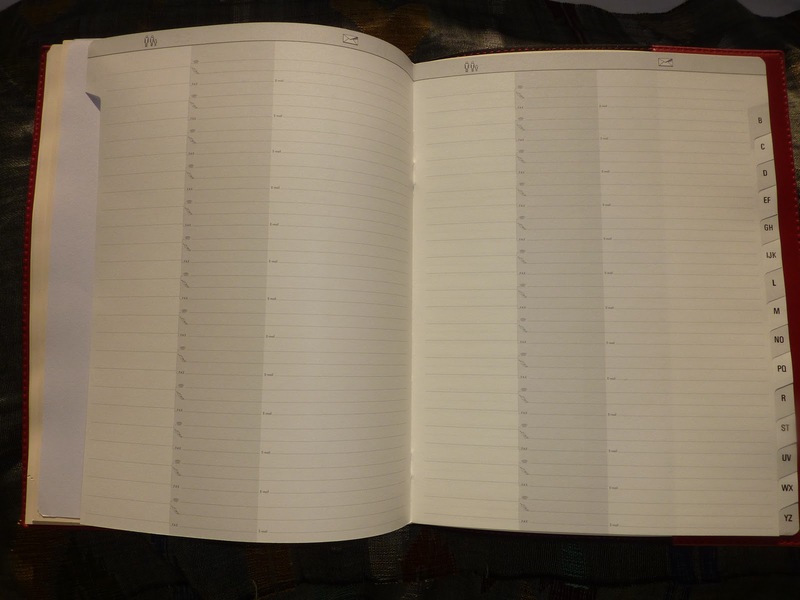 For some reason, the Filofax weekly format with my to-do list behind a tab just doesn't help me function nearly as well. It's a very common theme for me to try to make it work with my Filofax and then have to switch to a vertical weekly format to actually get anything done. 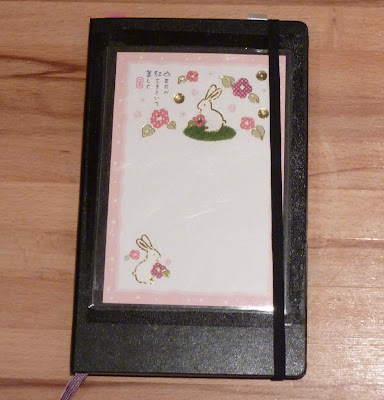 I'm sure I will continue to try to get my Filofax to work well for me, because it is so beautiful and I love it. But for the next few months at least, aesthetics will fall by the wayside as every bit of functionality I can muster will be required. I'm collecting them like Filofaxes! 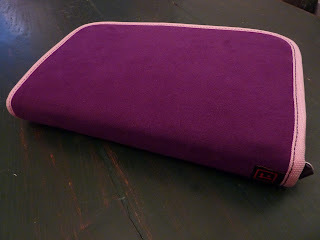 I couldn't resist panic-buying the Daily Planner folio in the discontinued purple faux suede. You may remember I have the Classic folio in the fuzzy purple faux suede. 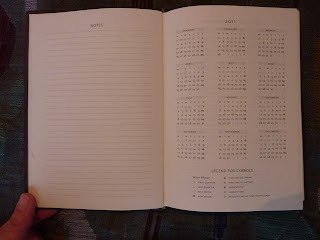 Classic size holds a large Moleskine notebook or weekly planner. 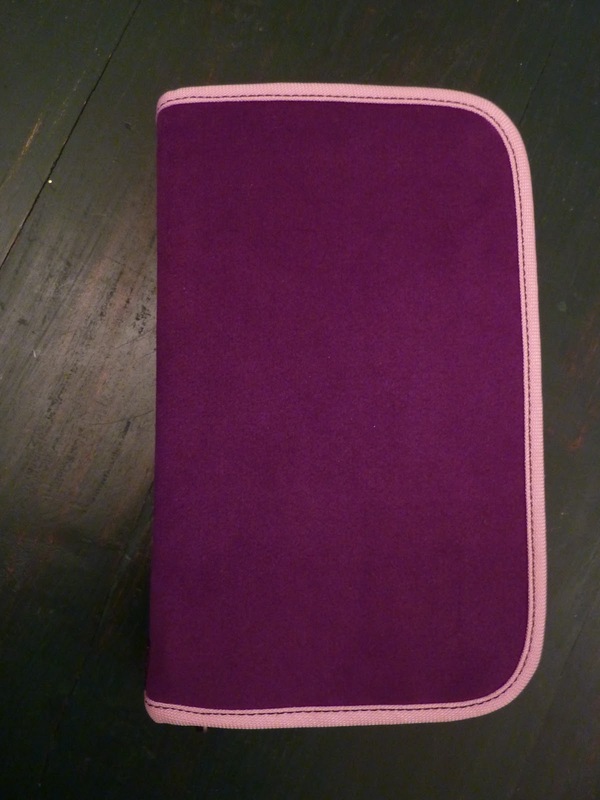 But last month I decided I also want the Daily Planner folio in the fuzzy delightfulness of the faux suede. So imagine my dismay when I got on the Rickshaw Customizer website and found they were no longer available! Earlier this month I got back to them again, ready to buy. Joe was out of the office for awhile so Kati took good care of me. They weren't phased by my PayPal wackiness (US billing address, UK shipping address). 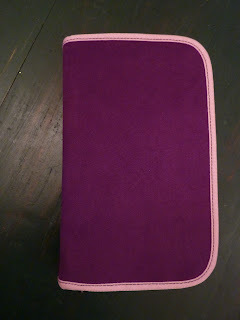 And my wonderful custom-made Folio got here to me in record time! I knew that I would pay a lot extra to have it shipped here to the UK. 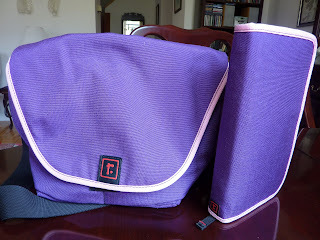 I chose FedEx shipping with tracking and insurance, which cost $30 (although I could have chosen a cheaper option). And import taxes and VAT cost me another £16. 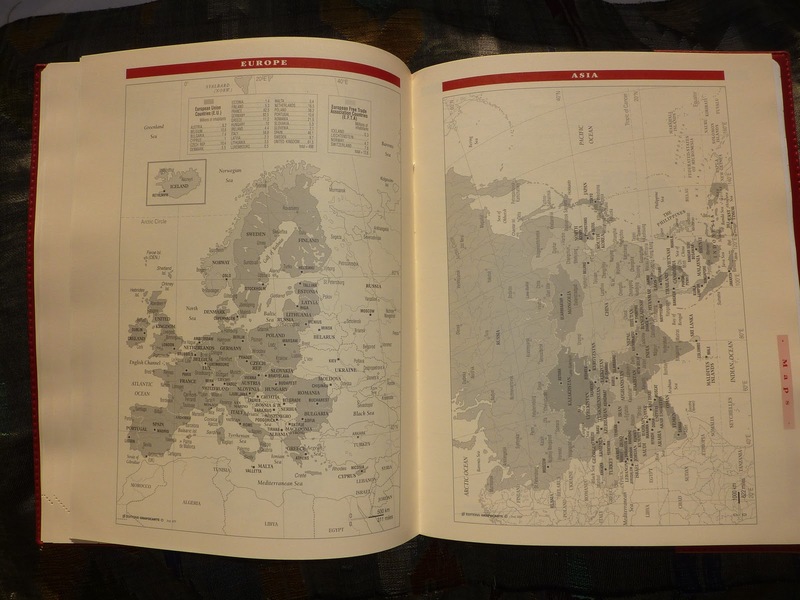 But for me it was worth it to get the Folio I wanted. 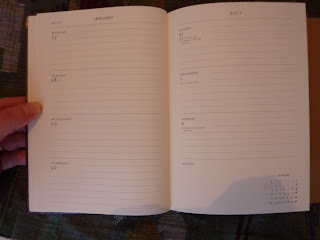 Here is my Daily Planner Folio! 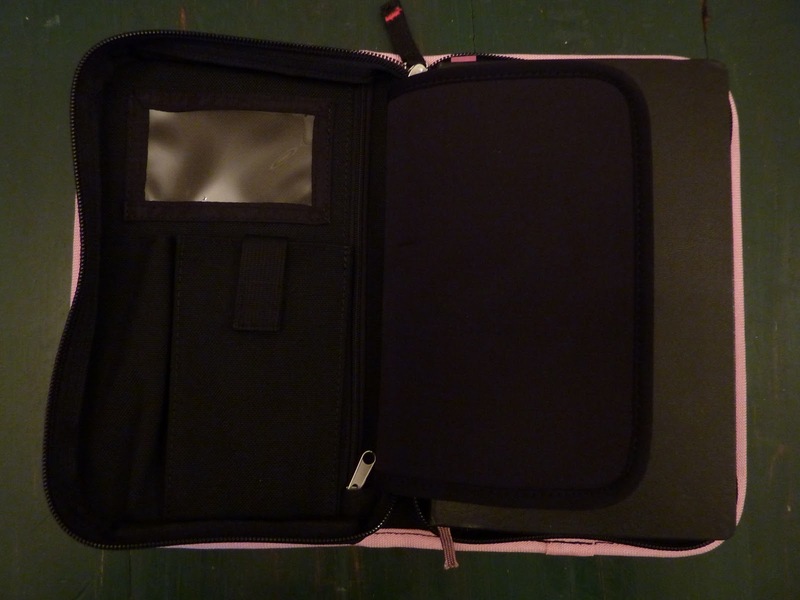 The Folios are perfect for traveling or commuting with your Moleskine. Inside there's a pocket to hold a couple of pens, and a smartphone pocket. 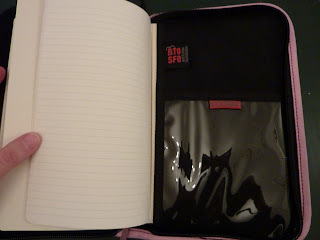 There's also a clear card holder pocket, and a zip pocket to hold your passport, money, or papers. The large Moleskine Daily Planner's back cover slides into the folio to hold it securely. Inside the back cover of the Folio is a clear pocket so you can see what's in it. Genius! The zipper area is expanded to accommodate the thicker Daily Planner. Your planner: planning tool only? Or a record of events? I'm curious about how other people use their planners. I use mine for planning of course, but I also refer to it (weeks, months or even years) later as a record of events. For example, I kept my planner that I used in my last job. 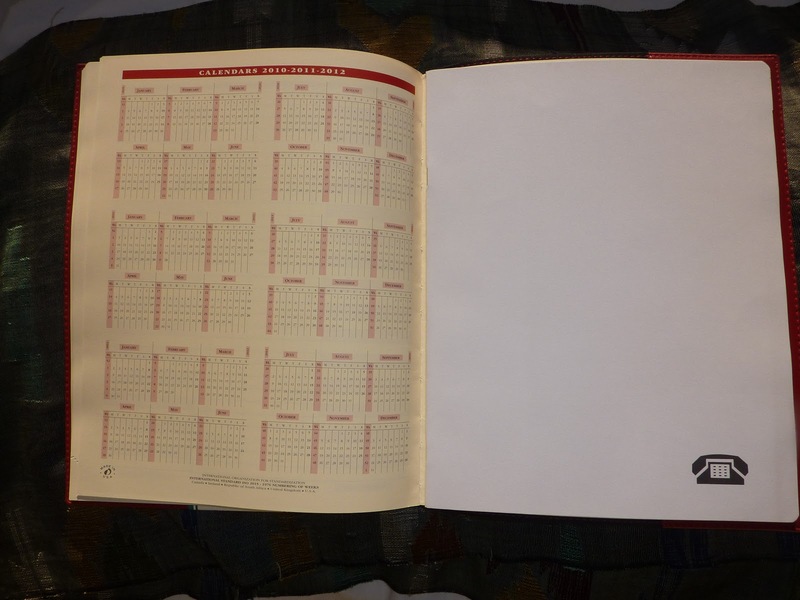 (Uncalendar Full Size, for those of you who were curious.) In it I recorded all the corporate trainings I attended (which were a lot). Now when I apply to my next job, I can refer to that list of trainings. If I'd kept that list on my computer at work, it would have been lost when I left that job. 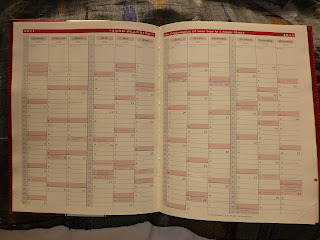 Some people use a diary/ planner book mainly for recording daily activities. 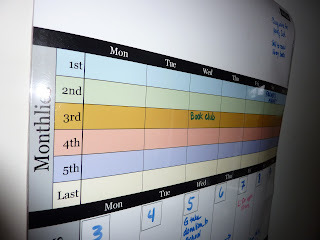 An example of this is Diane B's daily book where she records what she did at work each day, to make it easier to write up her monthly reports (which I think is a fantastic idea, and I have linked to her post before). Those of you who have been reading Plannerisms for awhile will notice this is a theme I contemplate often. 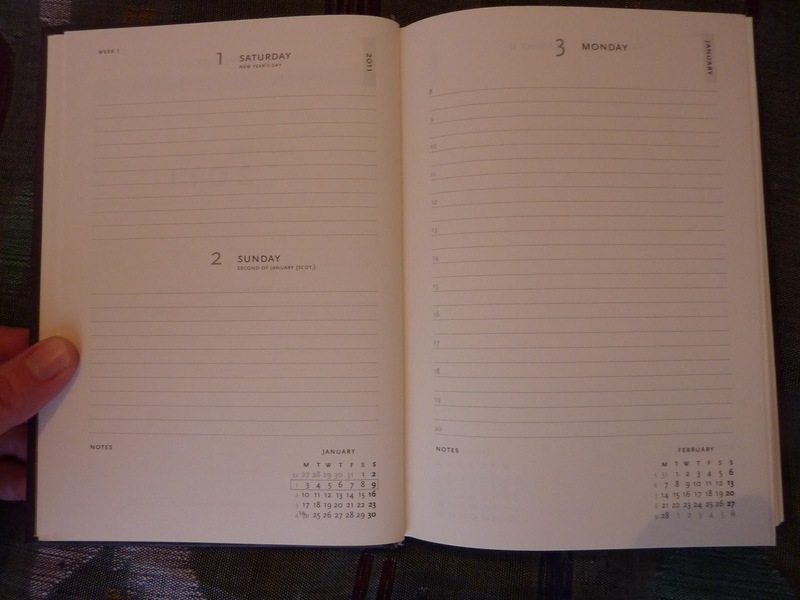 What works best for me as a planner (weekly view) is different from the type of planner I like to keep records in (day per page bound book). 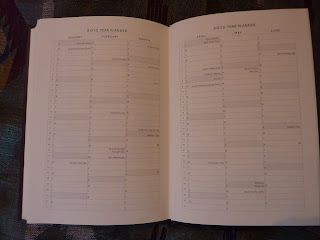 Sometimes I wonder which is more important, a planner that's easier to plan ahead with, or a better record of my life? What about you? 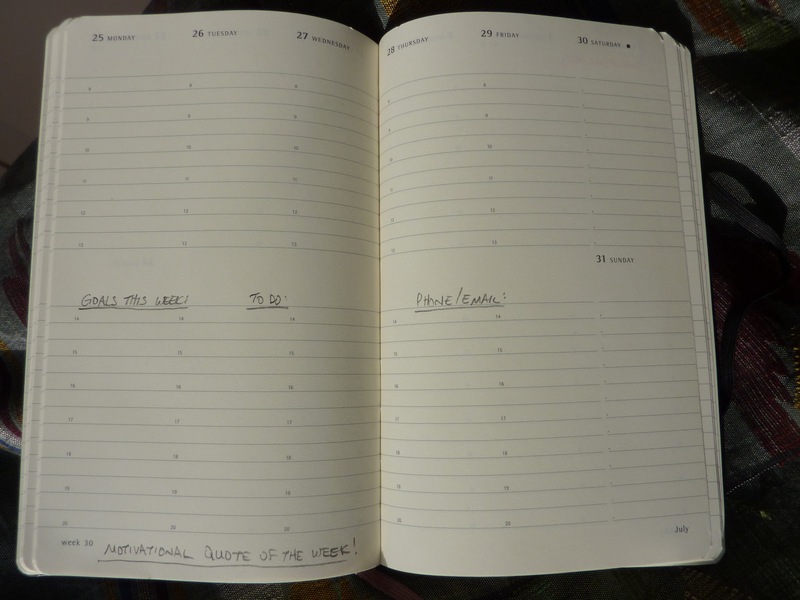 Do you use your planner as a planning tool only (forward-looking)? Or do you also (or mainly) use it as a record of events to refer to later? I'm so excited to review this planner! 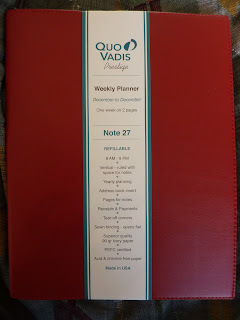 This is the newest planner from Quo Vadis's Prestige line, the Note 27. Many thanks to Karen at Exaclair for generously sending it to me! 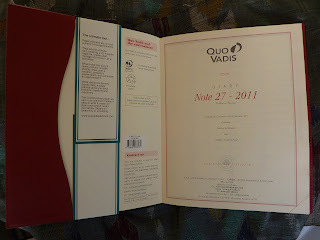 Click here to see the Quo Vadis info page for the Note 27. The first word I would use to describe this planner is "classy." The second word is "large." The page size is 8 1/4 by 10 3/4 inches. And every single inch of this book is elegant. 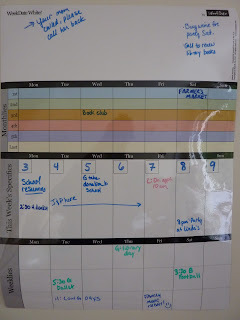 The weekly layout is a huge week + notes format with the days on the left page (with equal space for weekend days, hooray!!) 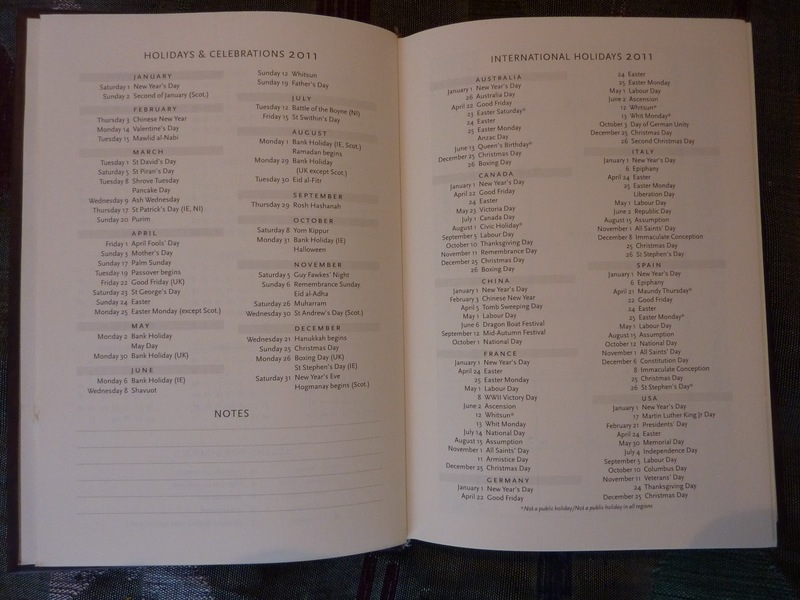 and the entire right page open for lists and notes. The days have timed lines from 8am to 9pm. 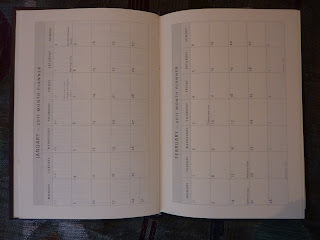 Holidays and phases of the moon are printed above the day spaces without taking any space away from the schedule area. 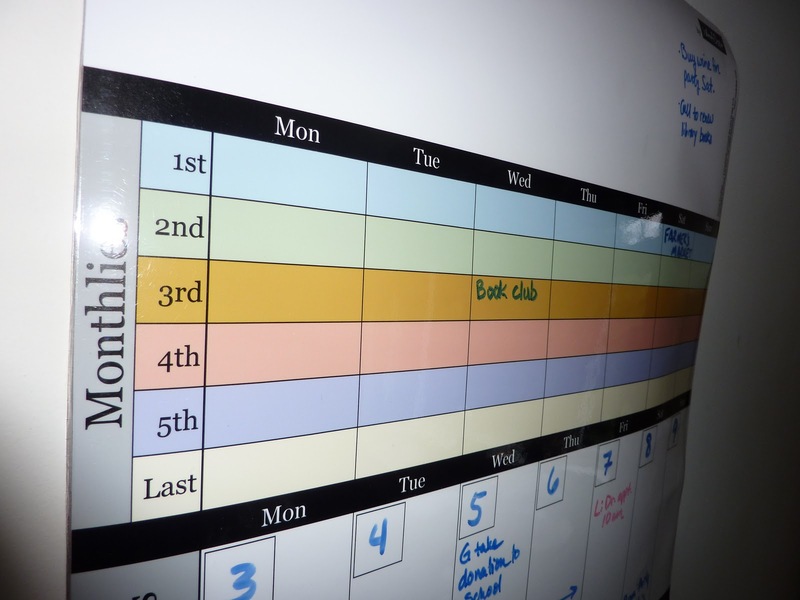 Monthly planning calendars for last-this-next month with the current week highlighted are at the bottom of the notes page each week. If you click on the photo to enlarge, you can see that the notes page has dots alongside the lines for the day spaces on the schedule page. 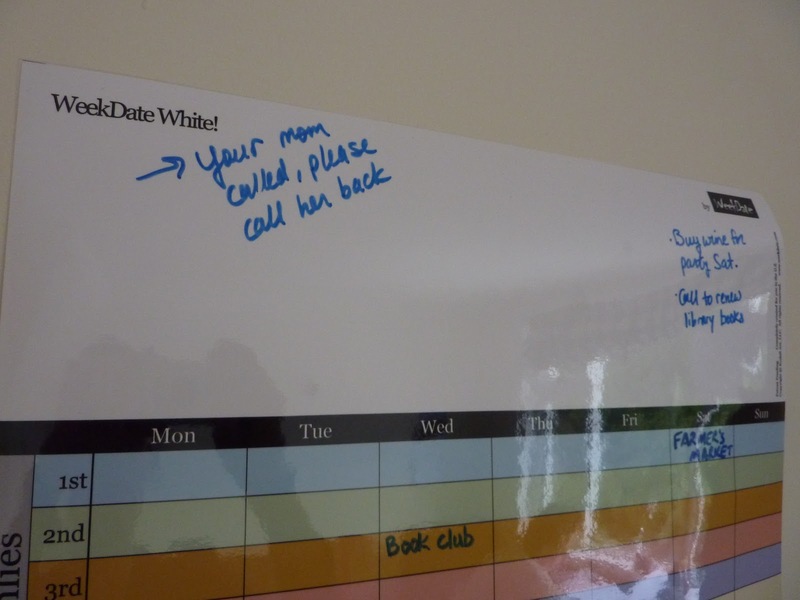 This makes it easy to delineate notes for a particular day if you want. Week numbers are printed at the top of the notes page, and week numbers are also noted in a small tab running down the edge of the pages to help you find the week you are looking for easily. 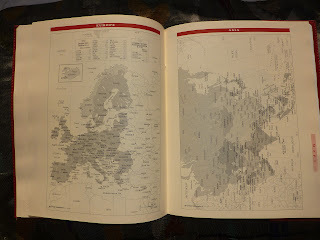 The pages are printed in gray and red inks for a distinctive look. There is also a planner just like this at the back of the book for all of 2012 to write in next year's events as they come up. 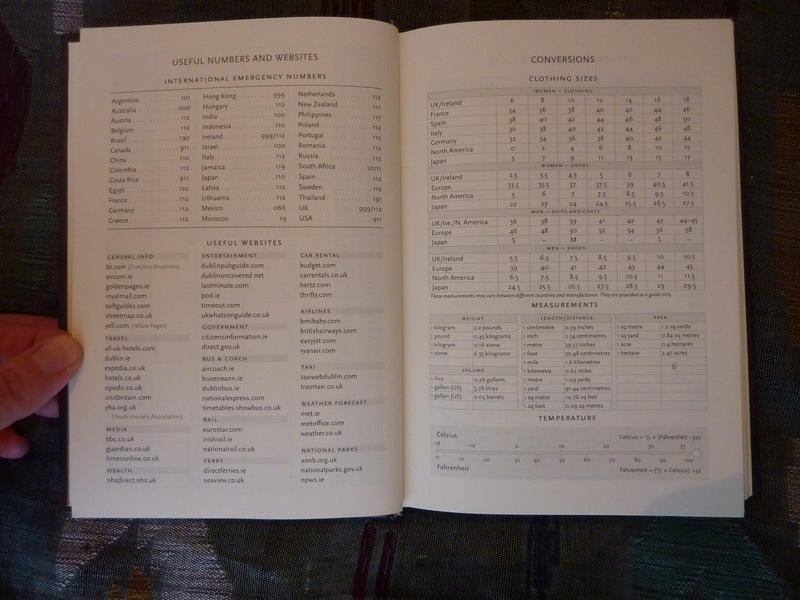 The tabbed alphabetical pages can be used for contacts, or filing other information. 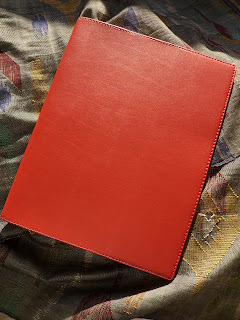 This planner came with the elegant red Soya cover that looks like leather and is soft to touch. 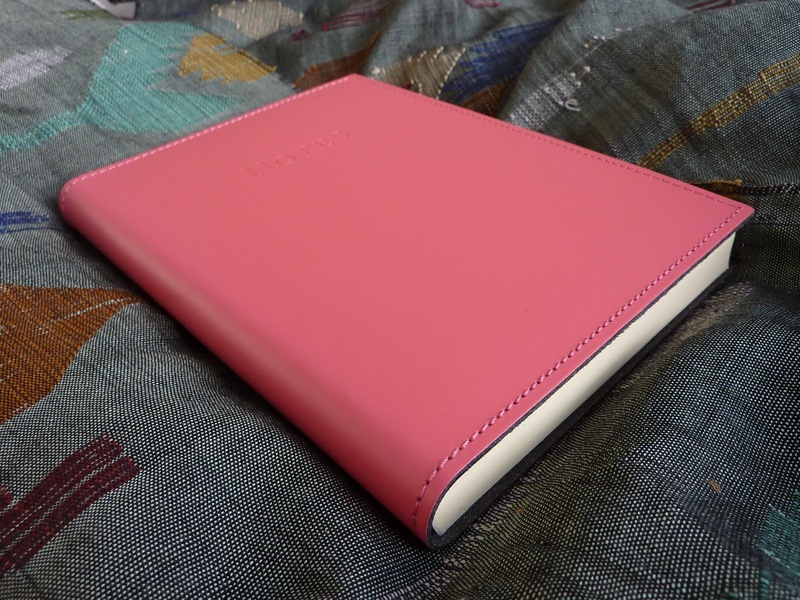 The Note 27 planner also comes with Club, vinyl or leather covers. 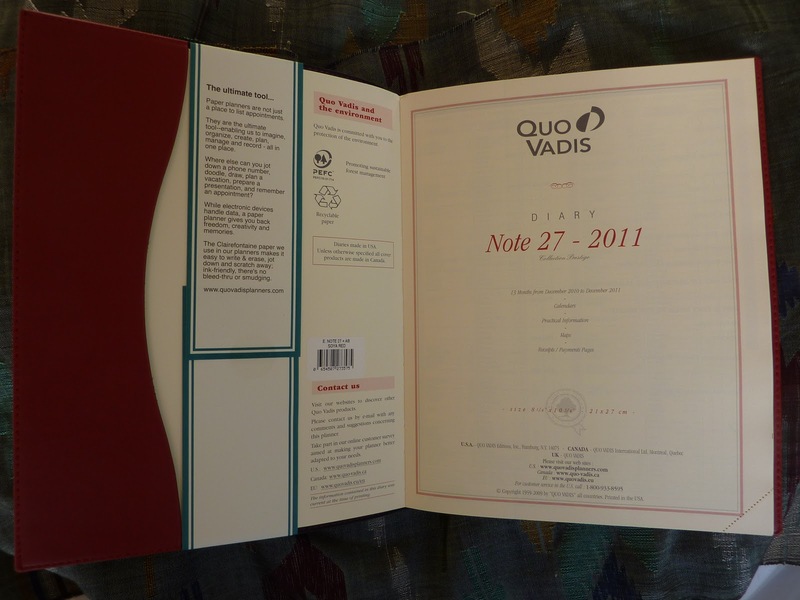 Click here to see the cover options and how to purchase the Note 27 planner. 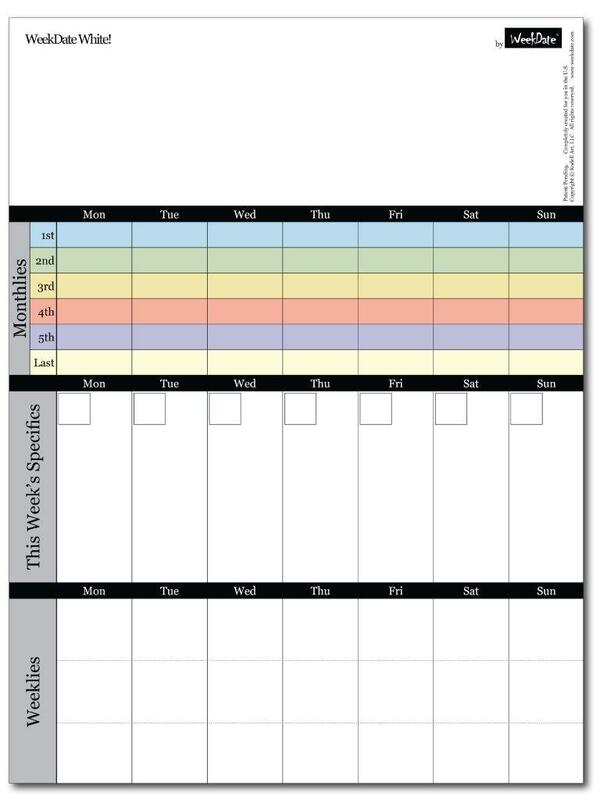 This is a fantastic planner if you need lots of writing space each week, and want the same amount of space to write on weekdays and weekends. Even though the page size is large, the book itself is still only 1/2 inch thick so it is very portable in a work or school bag or larger handbag. 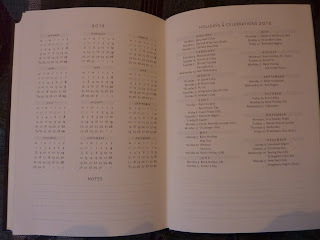 Many thanks again to Karen for sending me this planner! For the first time in several years, I'm not making New Year's Resolutions this year. I'm making some Anti-Resolutions. For the past few years I've tried to be very goal-oriented, but I tend to take it a little too far. Instead of positively encouraging myself, I tend to criticize myself for goals not reached. Well this year I'm going to do things differently. 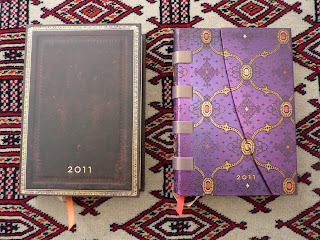 When I looked back over 2010 (I refused to call it a Year in Review) I realized I did great. Yes there were some goals on my list that I didn't achieve. But considering all the stress, change, and unexpected stuff that came my way last year, I did awesome. 1) Lose Weight. Don't most people who make resolutions have this one on their list? Well I for one am tired of it. Yes I managed to lose some weight last year. But this year I don't care. Usually when I lose weight it's because I'm too stressed and/ or sick to eat like I normally do (and normally I have a very healthy appetite). So this year I'd rather be fat and happy. Instead of thinking about losing weight, I will focus on eating more fruit and veg and getting more exercise, both of which are positive and enjoyable. 2) "Should." This one is the worst. 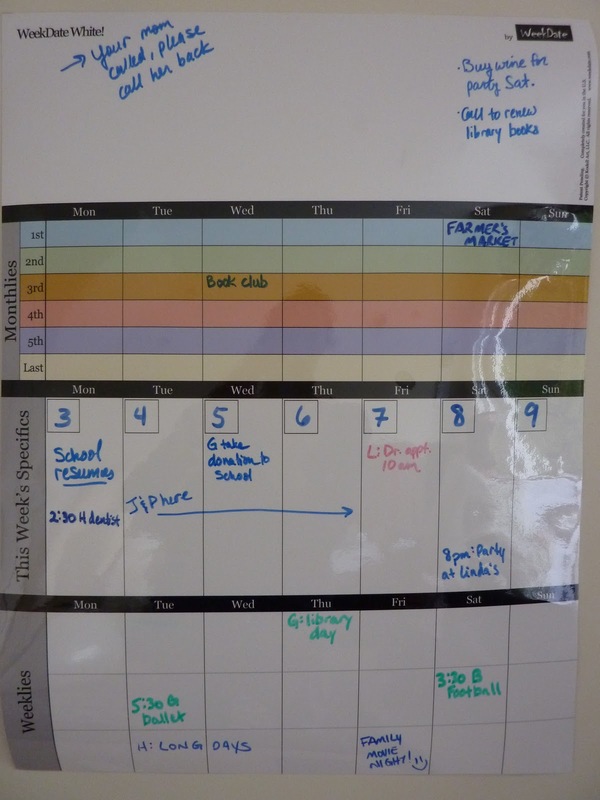 This is the dark underbelly of goal setting. When I get too rigid about my goals, I spend too much time thinking about what I "should" be doing right now, what actions can I do right now that will bring me closer to my goals? Well this year I'm letting go of this one too. Instead of being so uptight about what I should or should not be doing at any given moment, I'm going to look for more ways to have fun and enjoy my day to day life. 3) Work toward goals that don't exist in this dimension. Last year I had the unachievable goal of "working my way toward employment." 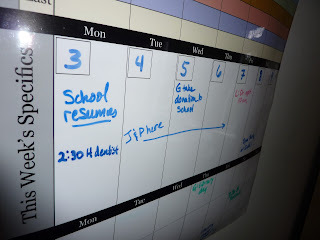 The idea is, my youngest will start school in the fall, and I want to go back to work. But without knowing where (or even on which continent) I'll be living, what my circumstances will be and what employment opportunities will be available to me at the time, there is nothing to prepare for. This year my goals are: To be kinder to myself. To cut myself some slack. To think of myself as forgivingly as I would think of a member of my family. (Why am I harder on myself than on anyone else??) And most of all, to enjoy this adventure that is life. 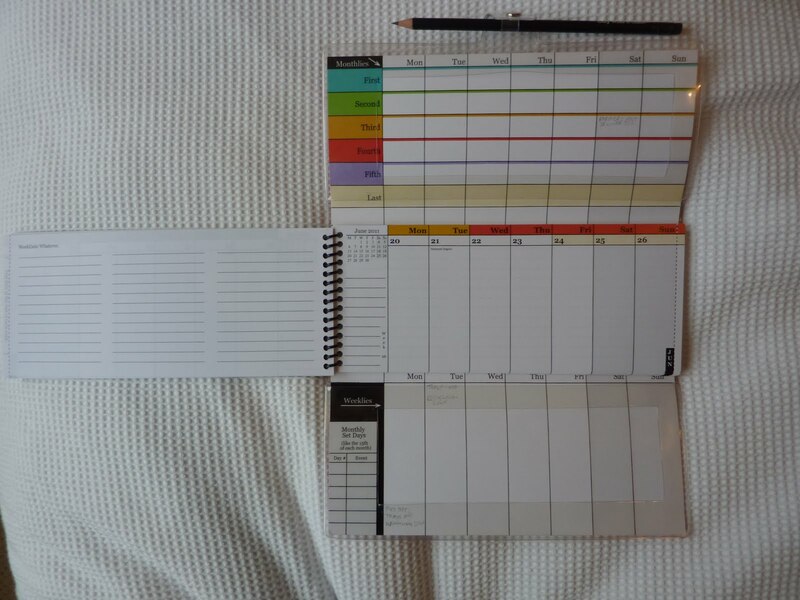 Here's what's been going on behind the scenes here at Plannerisms in the past couple of weeks: I finally took the plunge and made my own planner. Recently I found out that it is extremely likely that we will face yet another international move this year (and possibly very soon. Cue freaking-out). 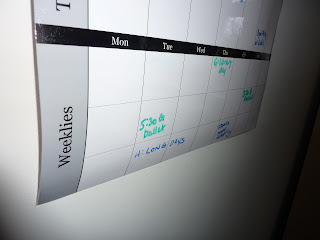 I love the WeekDate planner, and if my life were more consistent I would very happily use it. The WeekDate is the best system I've found for handling recurring events and not letting repeating weekly things slip through the cracks. But my life this year will be extremely varied from one month to the next in the run-up to the move, during the transition, and after we get where we're going (destination as yet unknown. Sounds familiar!!). 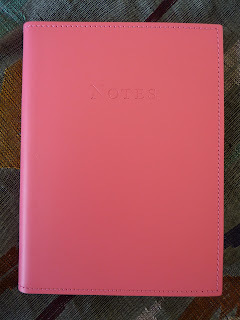 Because my goal is to settle on a planner by the end of this month and use it for all of 2011, I knew I needed to find a system that could roll with the changes all year long (and keep me sane in the process). You might remember my planner freak-out during my move last year where I struggled to find a planner that could handle my moving plans. 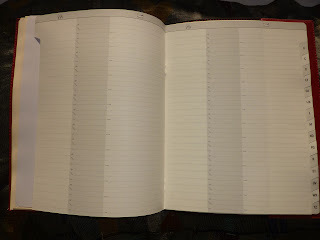 I also struggled to figure out a notebook system that would allow me to keep track of everything I needed to do to prepare for the move and when it needed to be done. So for my self-made planner I combined forward-planning (monthly and weekly views) with LOTS of notes pages, in one book. I used a large Moleskine hard cover lined notebook, because I happened to have a new one lying around and the size and page number were perfect, even though I don't like the black cover and ivory paper. I would prefer a colorful cover, and white paper. The Moleskine's ivory paper seems dark to look at every day, and for some reason this particular notebook has darker lines than in previous Moleskine notebooks I've had which I find a little annoying (and complained about in my post here). 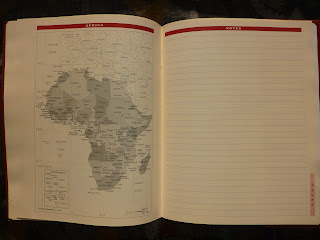 But, I didn't want to search for and buy a new notebook when the Moleskine would work just fine. After I had finished drawing it all up, I thought I wished I'd done it in an ecosystem Watermelon (pink cover) notebook, because the cover is pretty and the paper is white. But, after looking up the specifics I discovered that 1) the ecosystem notebook has far fewer pages than the Moleskine (192 in the ecosystem, 240 in the Moleskine), which would not have worked well for me, and 2) the cost of international shipping for the ecosystem notebook is about the same as the price of the notebook itself, which is crazy. If I decide to draw up my own planner again in the future I'll look for a different notebook with a prettier cover and white paper. 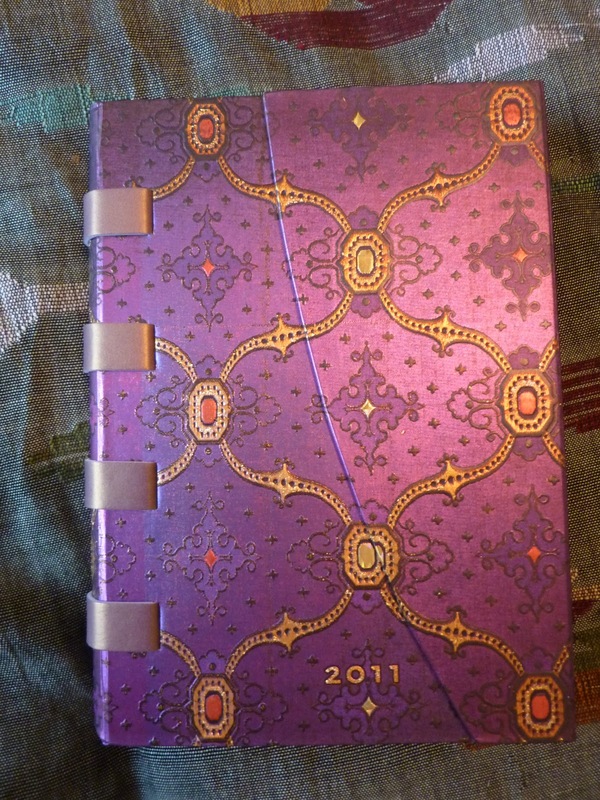 I did decorate the cover with the pretty Year Of The Rabbit postcard that I had on my Moleskine vertical weekly planner. 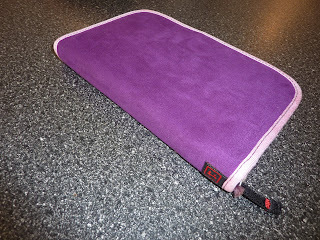 And, this planner lives in my purple Rickshaw Bagworks Folio so that looks nice too. 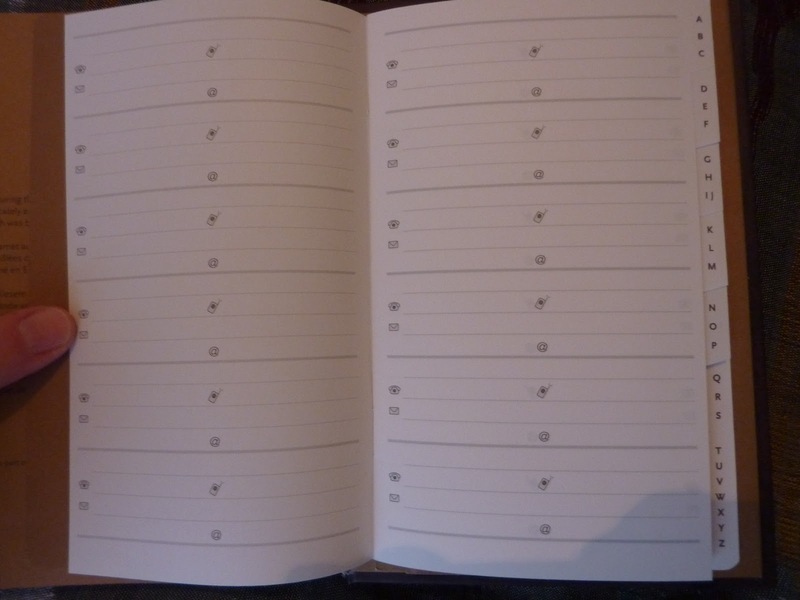 I designated some pages to write my goals. 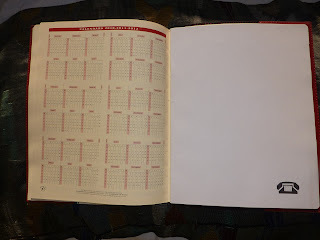 I drew up month-on-two-pages calendars. 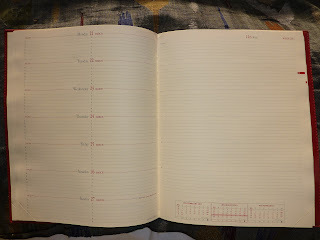 I have weekly pages with a similar setup to my Moleskine vertical weekly, with days as columns across the top and space underneath for lists. 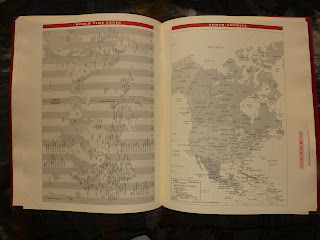 I taped in pages of international information including dialing codes, time zone map, conversions etc. 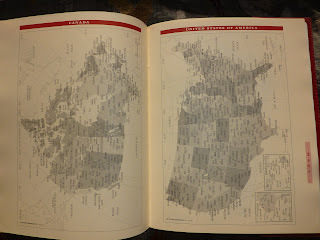 I also have a two-page spread for travel planning. Then behind all of that I have 60 (60!!) pages for notes, which I have numbered. 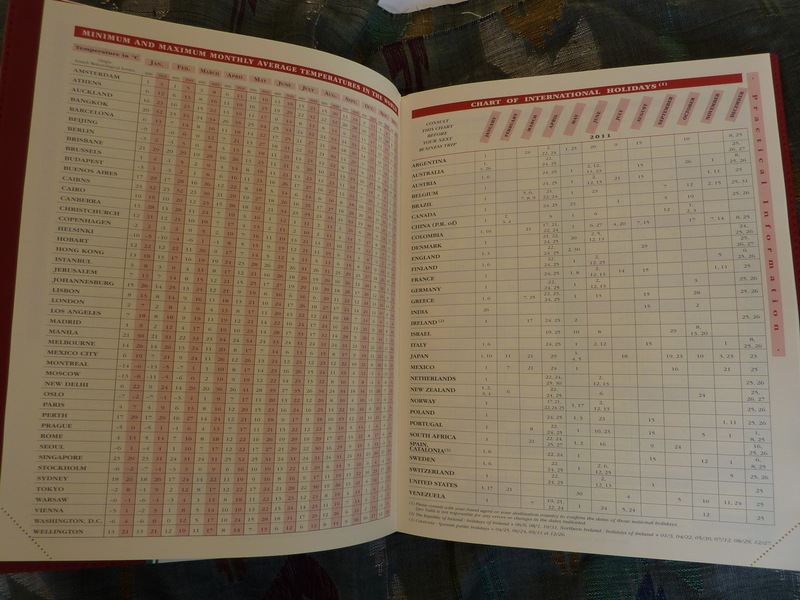 And the last two-page spread is my Notes Index where I can easily reference what I have listed on each Notes page. 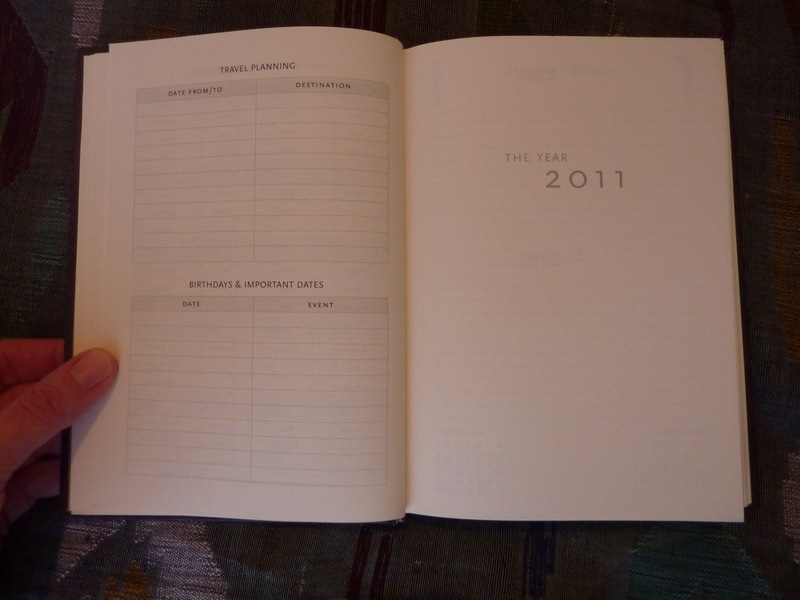 The large number of notes pages is the major difference between this hacked planner vs. the Moleskine vertical weekly planner. And because there are SO many notes pages, I don't feel like they are too precious to use. 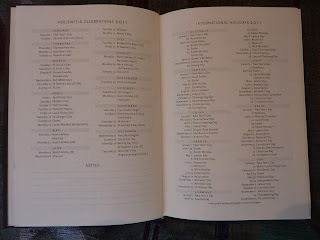 Because the Notes pages are numbered, I can easily use them for overflow on the weekly pages and reference which page to look at to find my list of guests for the party that weekend, directions to where I'm going on a particular day, packing lists, ongoing projects, and anything else. 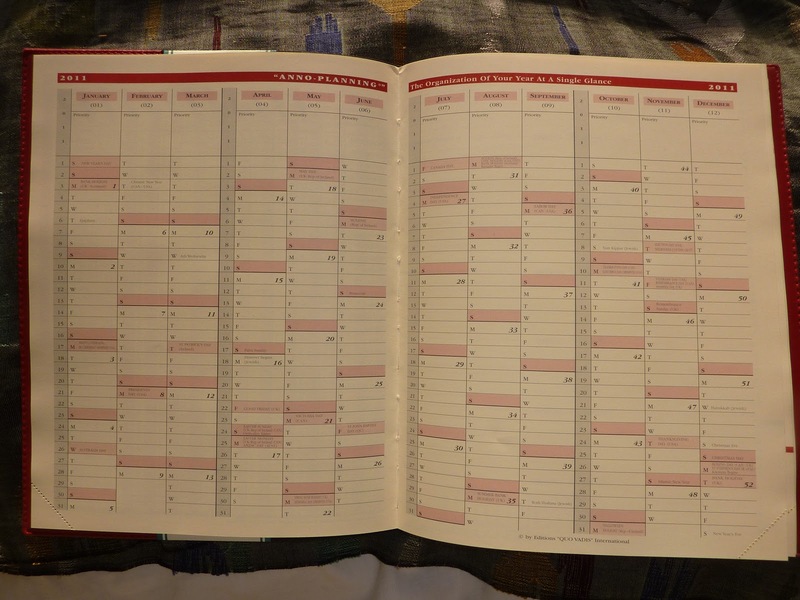 Having this information in my planner instead of in a separate notebook is more convenient for me, and would also be a more complete archive of my year in one book. 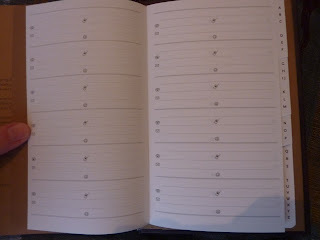 Tucked inside the back pocket of the hacked planner is the removable address booklet from my Moleskine planner. 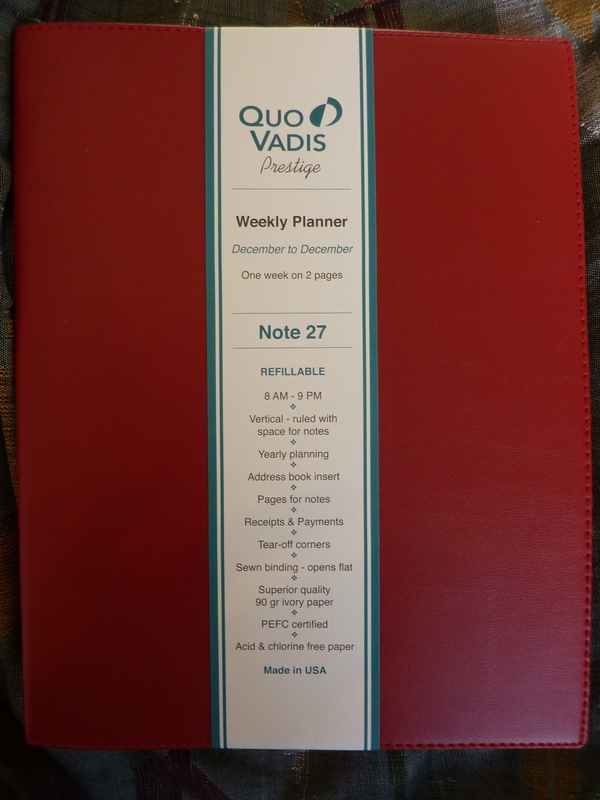 This planner system is incredibly comprehensive with goals, monthly and weekly planners, plenty of space for lists and notes, and my contacts all in one bound book. 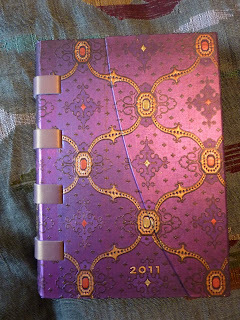 I used this planner for a week (Calling the Dog with it and my WeekDate), and it was scorchingly efficient. 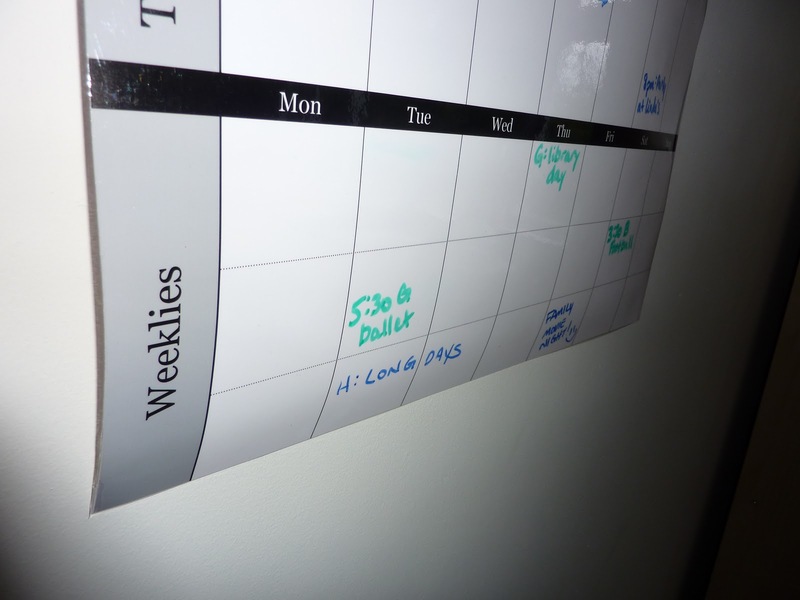 I cranked through a huge number of to-dos that week, met nearly all of my goals, and got a lot done. And I hated every minute of it. 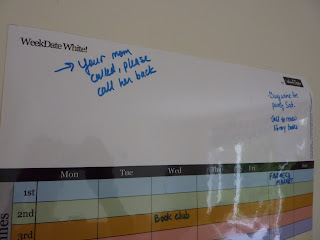 I was so focused on ticking off items from my to-do list I felt like I couldn't take time during the day to have fun. I was grumpy from so much productivity. 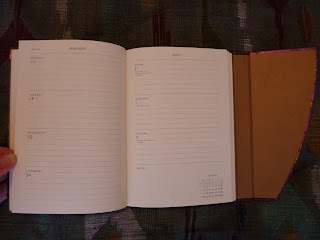 Then I went away for the weekend and missed my Filofax, which you can read all about here. So I'm currently using my Filofax, and trying to be normal about it and not over-stuff my weekly pages like I usually do. 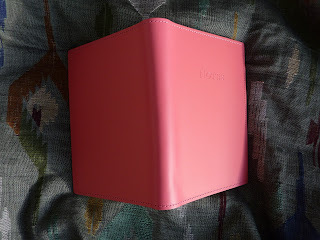 My Filofax is beautiful and fun, and I love it. (And having unlimited pages for lists is a huge bonus too). The good news is, if my Filofax fails for whatever reason, I have my super-efficient planner waiting in the wings to pull me through. Fun? Efficiency? I want to choose fun! I can't get over how beautiful this journal is!! I ordered this from The Paperie UK during their huge sale (which is in its final days, so hurry over there!!). This journal is the Bellini recycled leather journal in fuscia, click here for the product page. Yes that's right, it's on sale for only £12.75 (and free shipping)!! 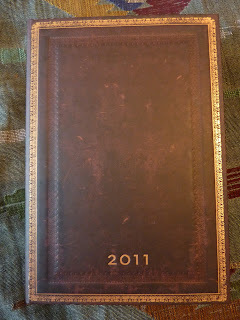 I wondered what the quality of the journal would be like at that price, but I needn't have worried: it's fantastic. The leather is thick, smooooth, and firm. Please note that the color in real life is a darker rose color than the lighter pink color shown on the website. The book measures 5 by 6 3/4 inches, which is such a nice size and shape to hold in my hands. 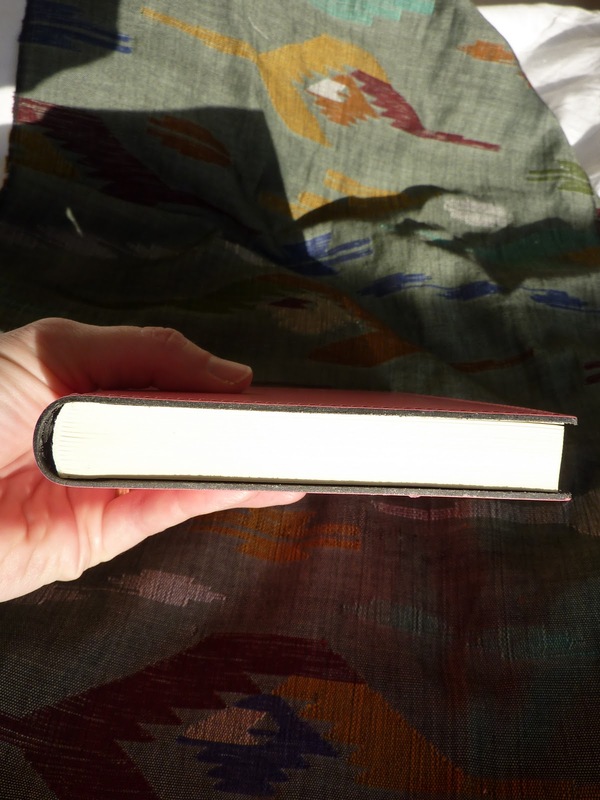 It's small enough to take everywhere in my bag, but large enough to have a big page size. 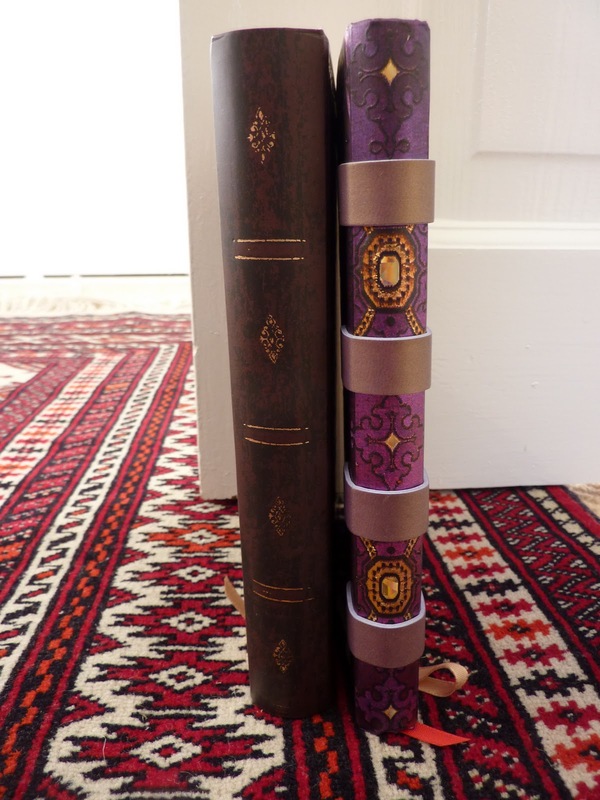 The Bellini journals come in two different sizes and several colors, and they are all on sale right now. 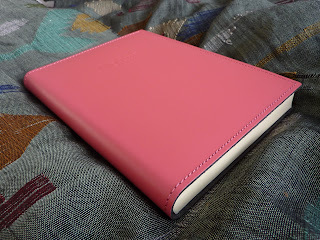 Click here to see the Bellini leather journal selection. 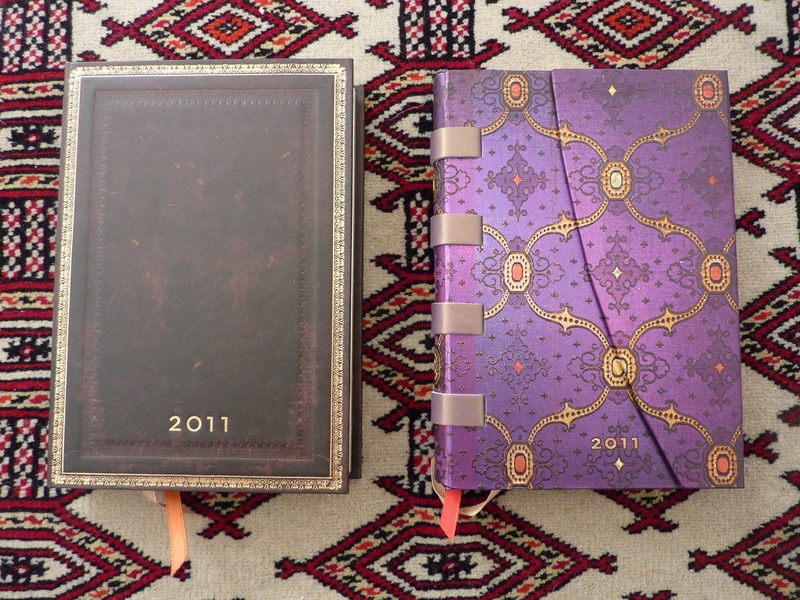 At this price, you could buy several of these journals to use yourself, or to have on hand for gifts. 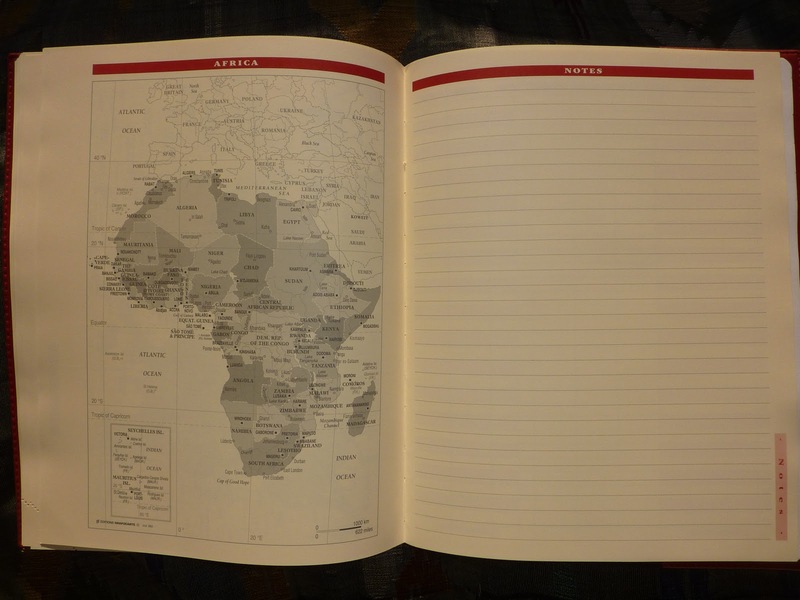 Anyone would be thrilled to get this leather journal as a very classy gift. And it was so affordable, I don't feel like this book is too precious to use! 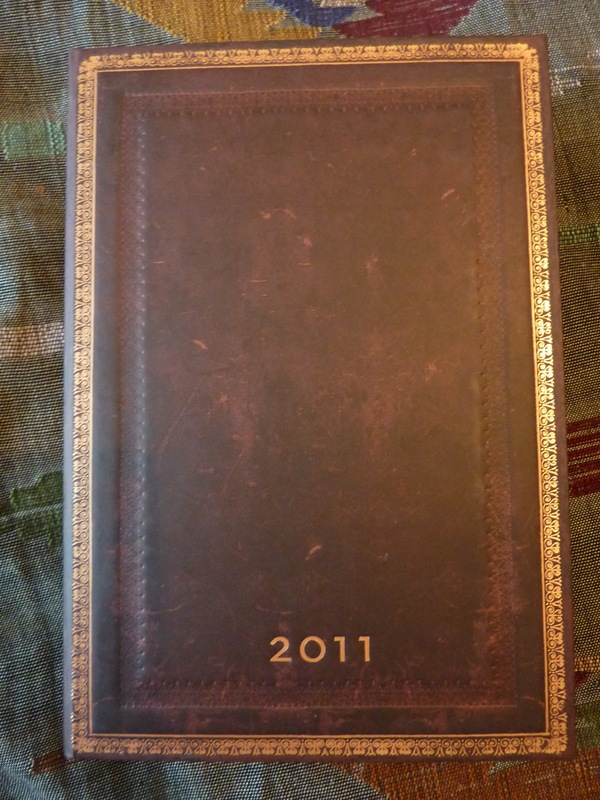 I look forward to using this as my journal when my current one is filled up. There are other leather journals on sale too, as well as notebooks (including the Jottrr notebooks I reviewed here awhile ago), cards, pens and more. The Paperie's sale is only on for a few more days, so hurry to check out their great prices on awesome products! I hate Moleskine's dark lines and paper this year! 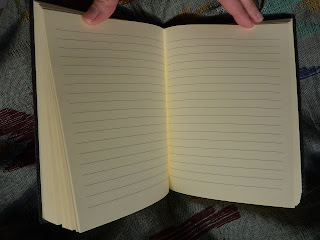 I opened up a new Moleskine notebook the other day and immediately noticed the lines are much darker than in Moleskine notebooks I've had before. I compared the new notebook to a Moleskine notebook I bought several months ago and not only are the lines much darker but the paper is darker too, and more yellow-looking. It is really not nice to look at!!!! 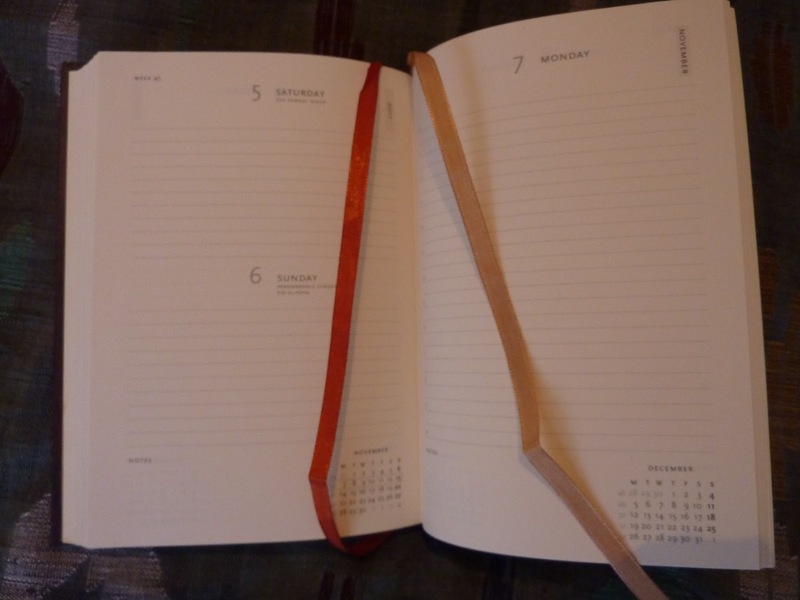 I compared my 2011 Moleskine planners to my 2010 Moleskine planners and found the same thing: in the 2011 versions the lines are much darker, and the paper is darker too and more yellow-looking than last year's paper. Dark lines are distracting, and dark paper is not nice at all to look at, especially all day every day when using a planner. 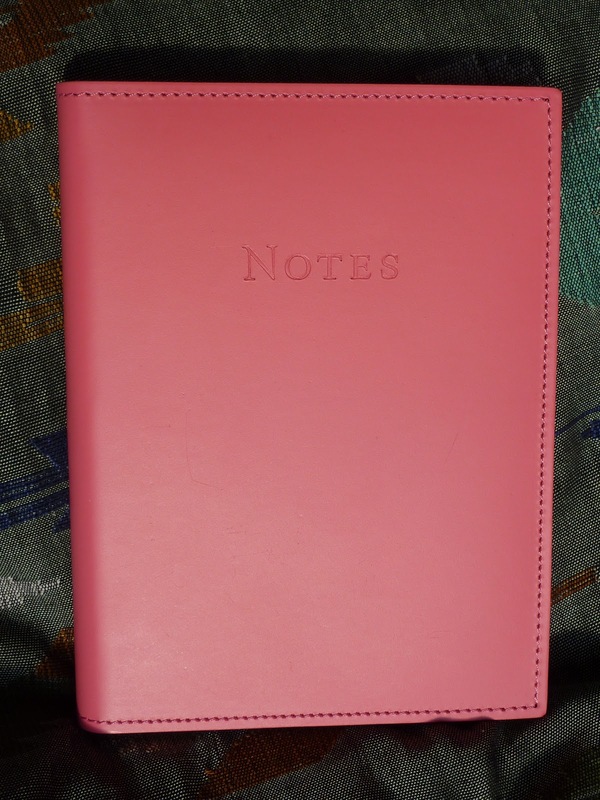 I won't be buying any more Moleskine notebooks until they change the paper and lines back to their lighter colors!! Is anyone else bothered by dark lines and paper? 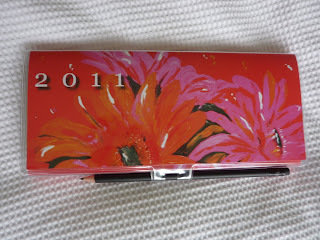 Some of you may remember my post My Ideal Planner where I speculated on what might be my ideal planner for 2011. I received a lot of great planner suggestions from people in the comments. One of those very nice comments was from Zed who said, "Laurie, I swear by Paperblanks' Dayplanners (I'm a sucker for anything beautiful). Have you considered any of their books?" "Zed, I agree the Paperblanks planners are beautiful. But, (and I am going to sound like a major snob here), I don't like that the covers are fake. 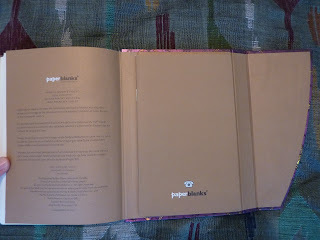 I don't want a book that looks like it's leather-bound but is actually a paper cover. I'd rather get a real leather-bound book. Or covered in Sari silk, or Moroccan or whatever. That sounds horrible but I'd rather have the real thing or not at all. And, they don't have a vertical weekly + notes format." Chris, who works for the publishers who make Paperblanks planners and notebooks, noticed this comment and very graciously emailed me. 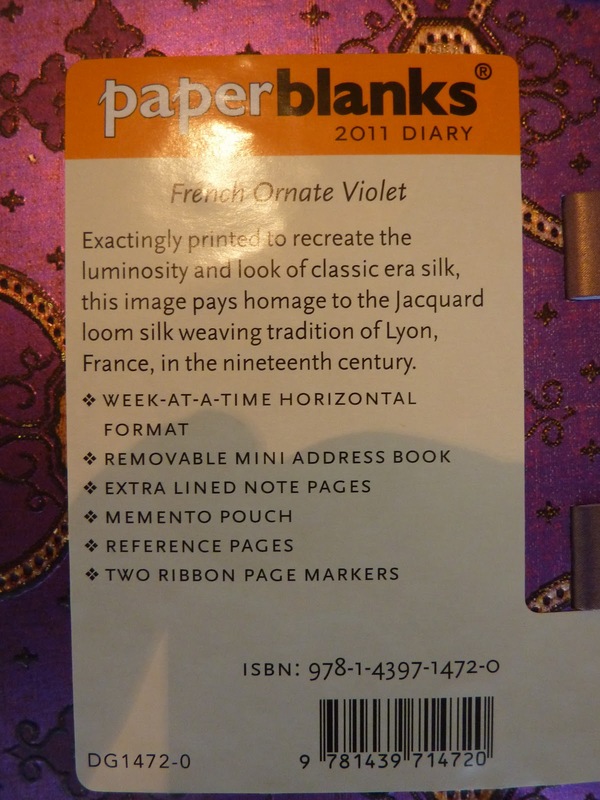 First, he pointed out that Paperblanks actually does sell a vertical weekly planner with notes space on the weekly pages, in Europe, which I had not been aware of. This version is not available in the US because the horizontal format is much more popular there. Second, he very kindly offered to send me some Paperblanks planners to review here on Plannerisms. And of course I happily took him up on his offer! Thank you very much Chris! 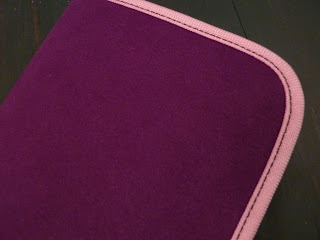 He sent me a weekly planner with a beautiful purple cover, and a daily planner with the leather-look cover that I was so quick to diss in my comment. 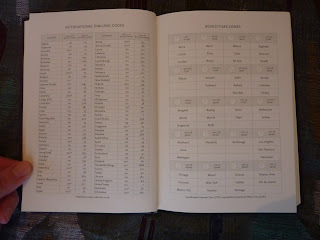 Here are the labels with info about each planner. Click on photos for a larger view. Both of these planners are the Midi size, approximately 4 3/4 by 6 3/4 inches, which means they are very portable. 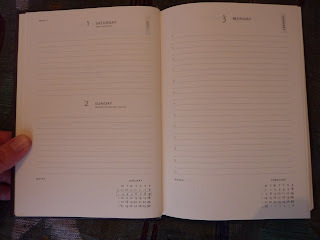 In fact, in my opinion this is the perfect size for a day-per-page planner. 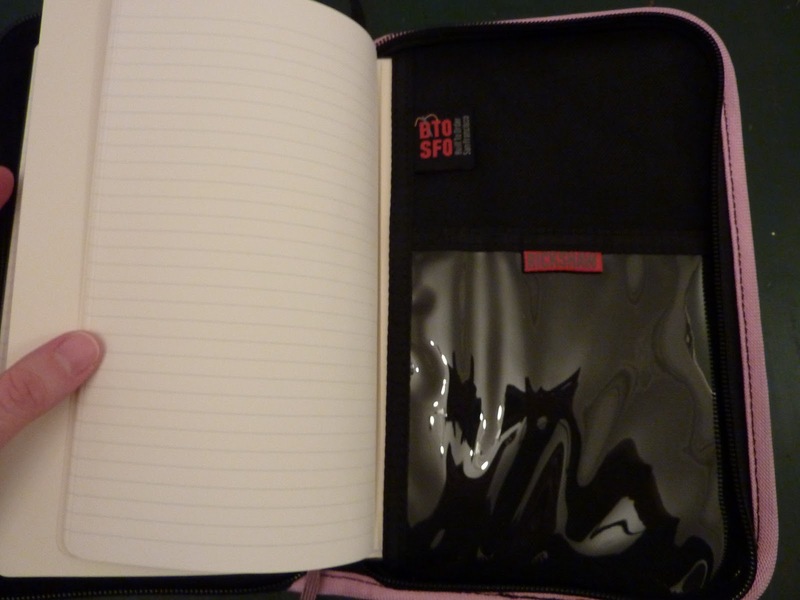 It has plenty of space to write each day, but the book still fits into just about any bag. 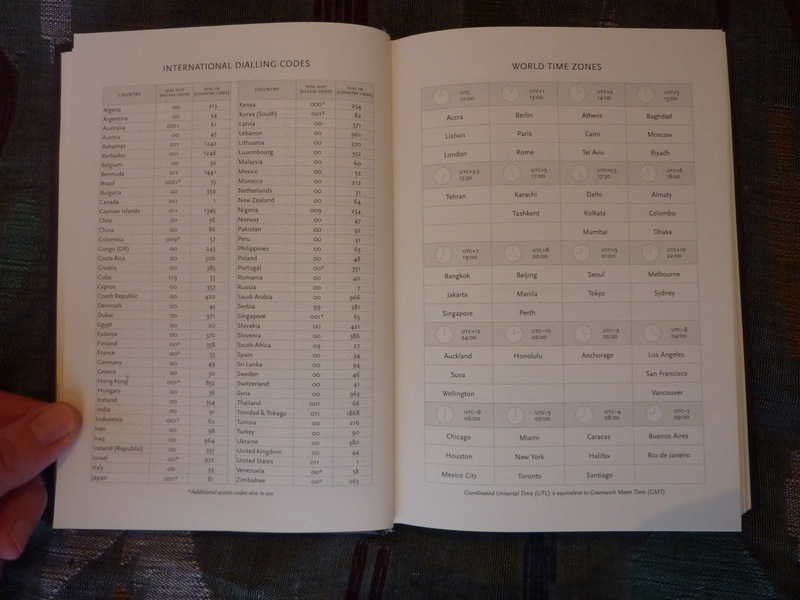 In both formats, holidays and phases of the moon are printed on the day spaces, which I really like. 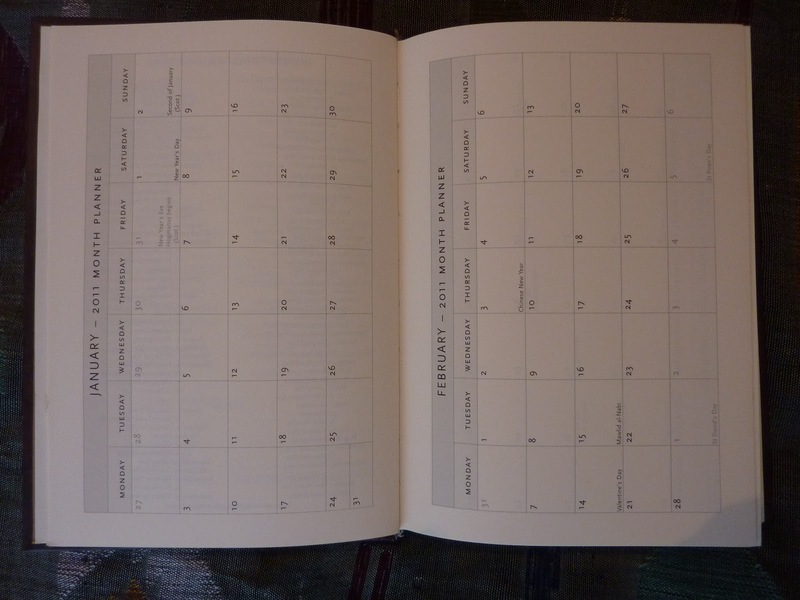 Also you'll notice both formats have monthly calendars printed on the pages, to help you visualize where you are in the month. 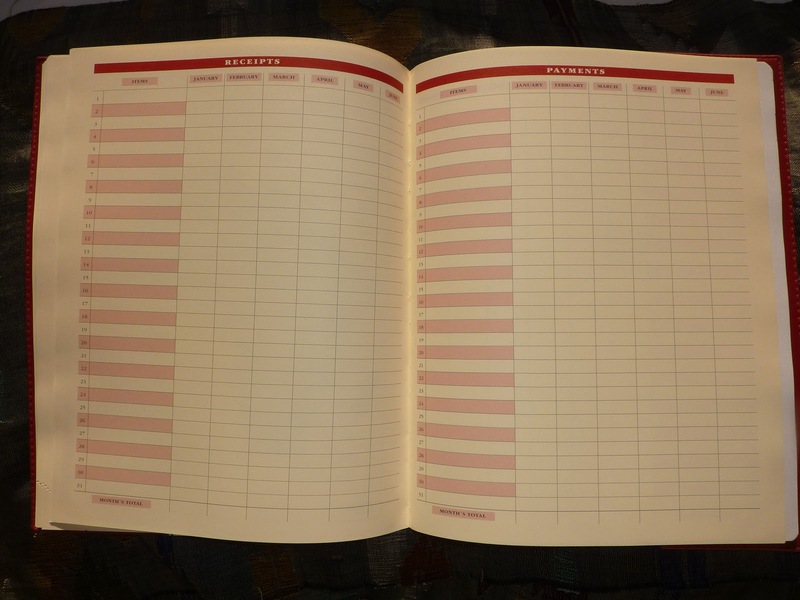 There's also a forward planner, and several lined pages for notes. 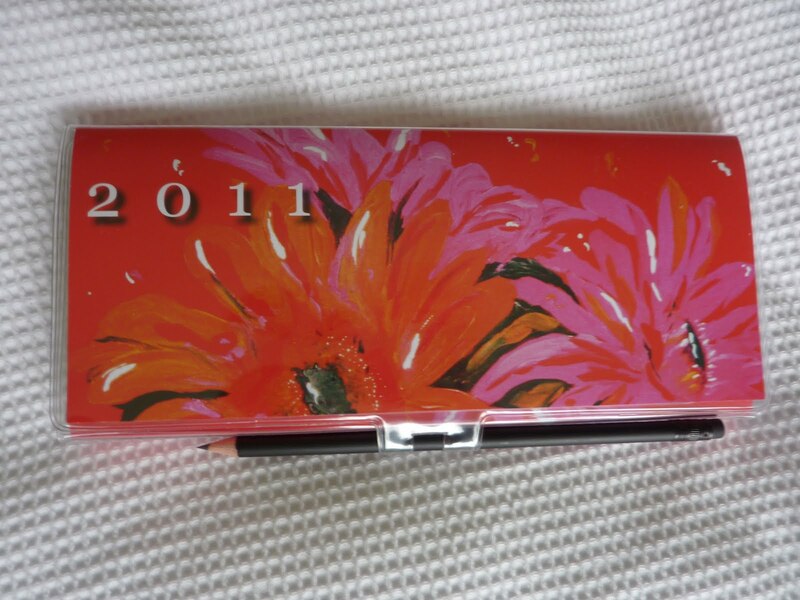 Both planners have TWO ribbon placemarkers, so you can keep your place in your daily and monthly sections. I don't know what the weight of the paper is, but it is thick and smooth. 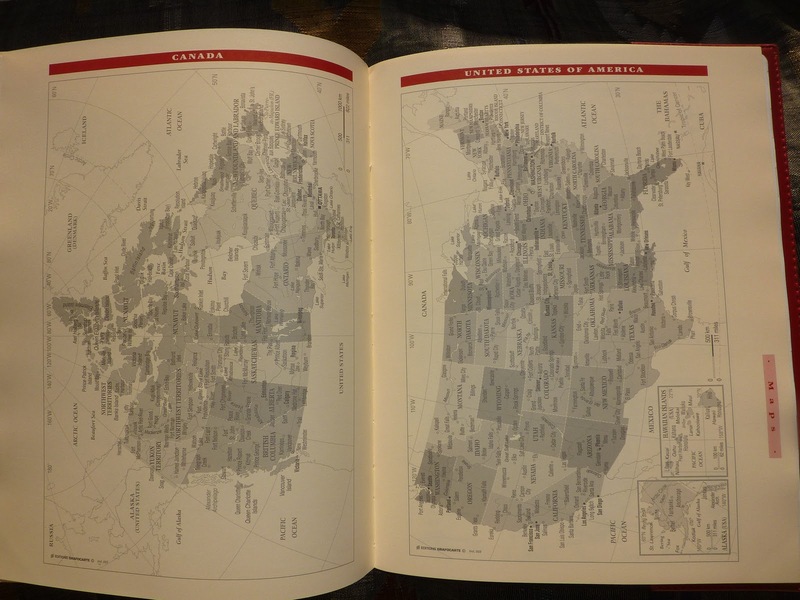 It has a slight ivory tint that adds to the classy look of the books. 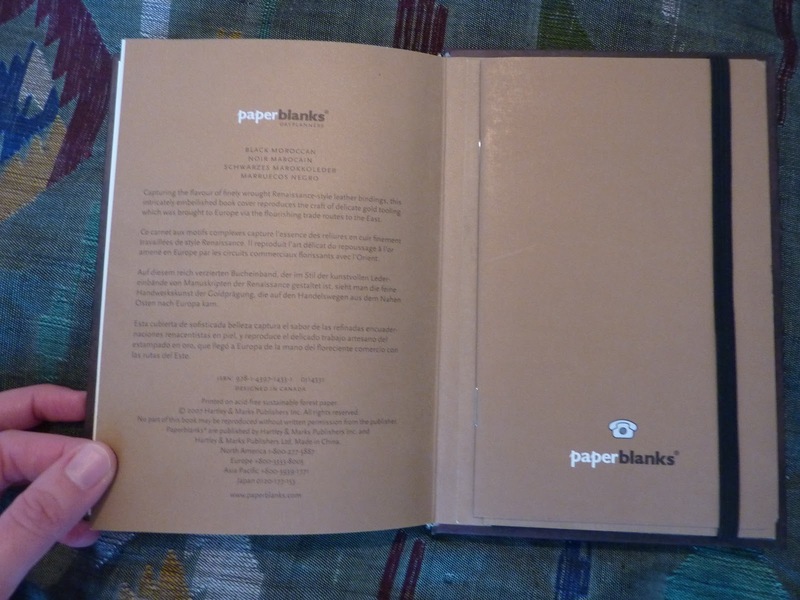 Click here for the Paperblanks website to see their products and find a retailer near you. 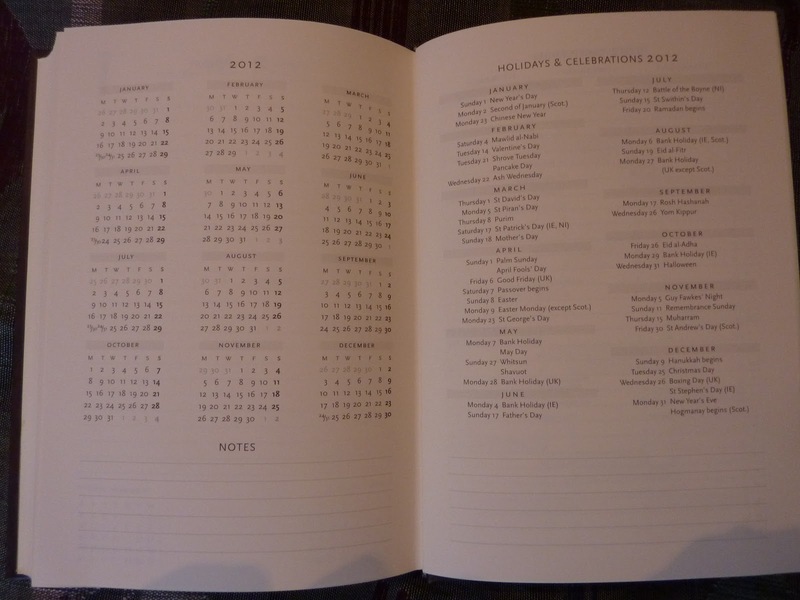 See their planner selection here and browse the interior pages of their planner formats (daily, weekly etc.) here. 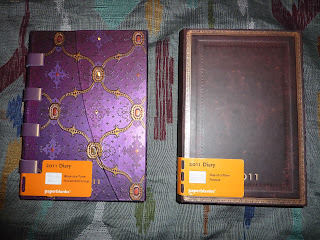 Many thanks again to Chris for sending me these planners to review! I have to admit the covers are beautiful, the books are well-made and have loads of great features. 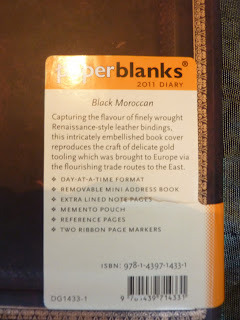 Now I finally understand why these planners are so popular!